Fikus for Millturn and the Driven-tool application offers a flexible and functional solution for today's toolmaker, and it is not dependent on the age or type of the lathe in use. Fikus for lathe and millturn is specifically designed to work fast and efficiently, using a wide range of innovative tools. It is specially optimized to achieve a high degree of efficiency for mass production and large product series, with the maximum quality and shortest machining time. 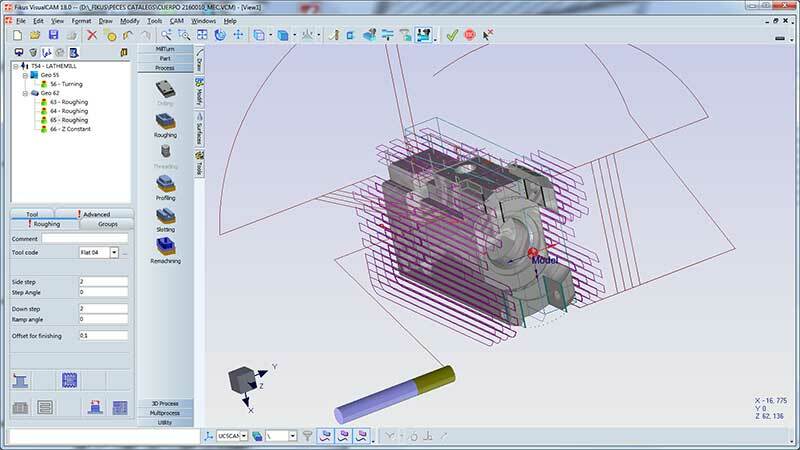 The CAD module counts with a intuitive interface with all functions any CAM programmer would need; Easily fix or modify geometries or importing geometries from other CAD systems via IGES, DXF or PLT. 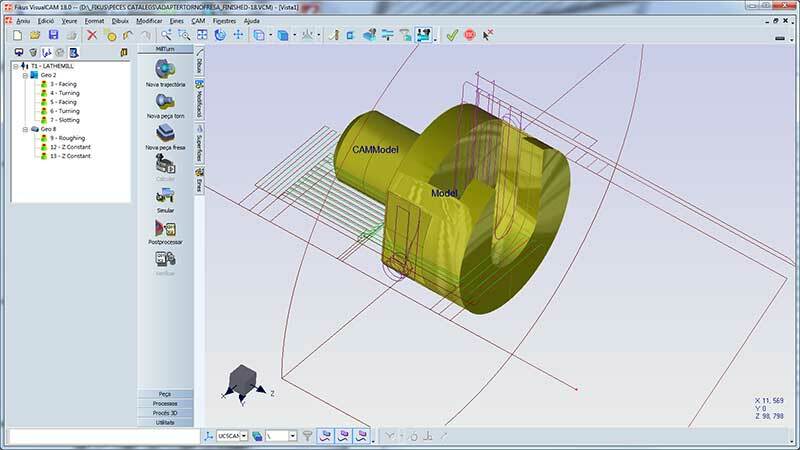 Fikus Visualcam for Millturn counts with a CAD module with a very handy function; The revolution contouring tool that can extract complex contours from 3d files. 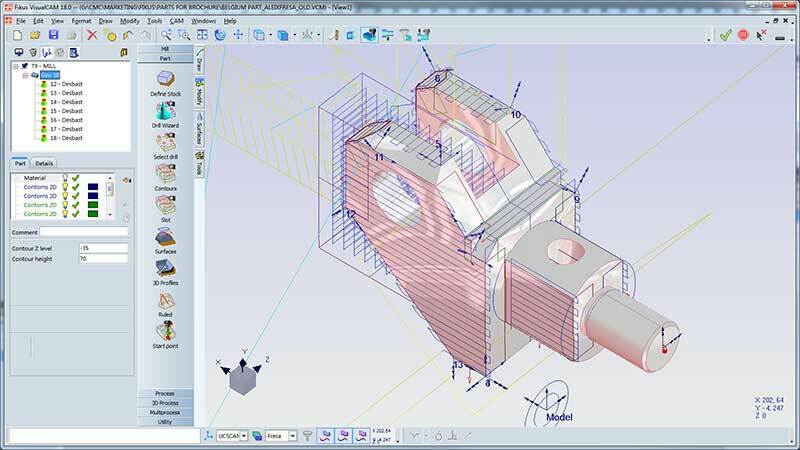 If you need to work with 3d models you can bundle Fikus Visualcam for Millturn with Fikus Visualcam 3dcad, Fikus Visualcam’s 3D Direct Modeling technology would change the way you think about working with 3D solid models because it lets you focus on your design without the complexity of traditional CAD. The Parameter Table lets setting the values of parameters for each procedure and its lathe and drill Wizards will recognize all the different zones of the part and would apply the right procedures and defined parameters. The Lathe Wizard automatically recognizes all the different zones of the part and apply the right procedures. The Drilling Wizard automatically selects the drills and classifies them per their size and type. With all the lathe procedures (Turning, facing, profiling, finishing, slotting, threading, cut-off) and 2.5D Milling procedures (Drilling, Pocketing, finishing) Frontal or side machining, C Axis continuous machining, C Axis positioning or Milling using X, Y, Z or X, Z, C.
The Fikus ToolPath Manager allows easy creation of lathe and milling procedures. This procedure is a combination of geometric and technological data presented in a logical tree, easy to create and edit at any stage in the process. The set of procedures may be saved as a template and applied to other geometries at a later stage. During the creation of the part, the user can visualize it as a solid rendered object and dynamically pan, zoom or rotate it using the OpenGL standard graphics operations. When changes are made (height, draft angle, or synchronizing the contours), they would be automatically shown on the screen. View manipulation can be performed during toolpath simulation. 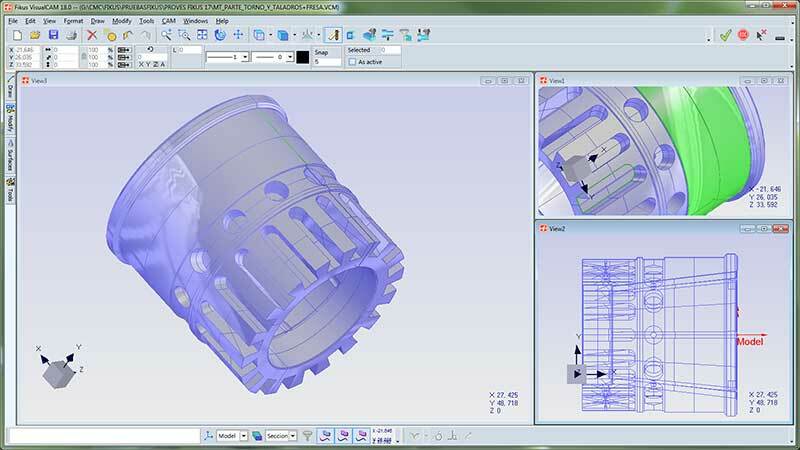 Fikus assists users in producing complex toolpaths thanks to its efficient wizards and toolpath algorithms; Furthermore, they can be stored as templates to machine similar parts in the future. Fikus automatically detects the geometry for lathe or drilling and generates the needed procedures. Customized tables for each machine, allow to obtain accurate G-codes and apply the most efficient and productive machining procedures for your machines. 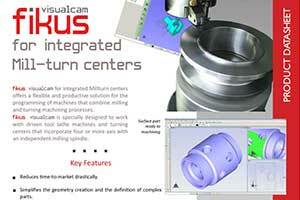 Fikus Visualcam ST is the Metalcam`s recognized software for the shop floor. A productive, versatile and easy to use CAD/CAM software that gets the maximum performance from your tool-machines due to machining assistants and dedicated postprocessors of most of machines in market. Click here or on the image to read, download or print the PDF file of our brochure.